BULK ORDER AND SAVE The Seed Savers’ Handbook is a complete reference for growing, preparing and conserving 117 traditional varieties of food plants. 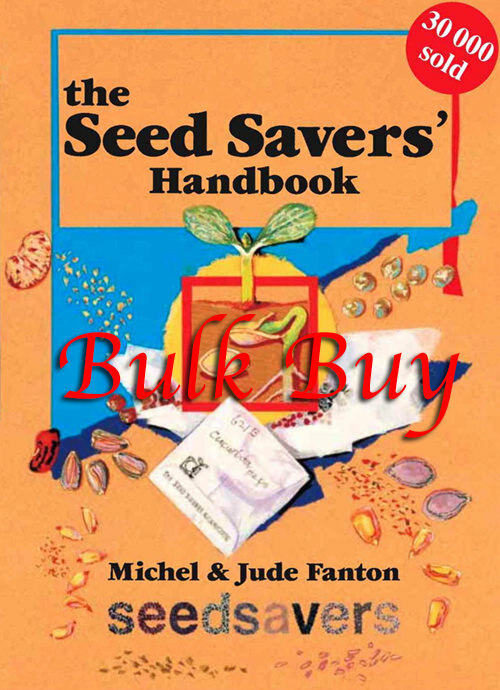 Written especially for Australian and New Zealand conditions in 1993 by Michel and Jude Fanton, founders of The Seed Savers’ Network. 30,000 of the original edition sold with another 30,000 copies of translations and adaptations sold around the world. SKU: N/A. Categories: Books, Bulk. The book begins with eight chapters on the issues around seeds globally and the practicalities of saving your own seeds. Three quarters of the book is on 117 food plants, mostly vegetables, with the remainder culinary flowers, herbs and spices. Each plant has a description, its wild origins, how to cultivate it, save its seeds or otherwise propagate it, storage of the seed and its medicinal and culinary uses. Permaculture, biodiversity, organics and companion planting are the principles that underlie the contents of this book. This has been a reliable reference book not just on propagating and breeding your own vegetables, but also for how to grow and use both common (corn, tomatoes, beans, cabbages, etc.,) and unusual vegetables, such as tumeric, peanuts and several species of gourds. Included are many Asian and South American vegetables, herbs and spices. 30,000 of the original Australian edition have been sold with another 30,000 copies of translations and adaptations sold around the world. TRANSLATION ON THIS SITE: There is also a Macedonian/Bulgarian version online. With the Japanese and Italian coming soon. How to save seeds or propagate by cuttings, tubers or roots, on the following 117 vegetables, culinary herbs and flowers. Also notes on cultivation, usage, origins and the meaning of the botanical name of each plant. Traditional varieties are described so that you can look out for them.